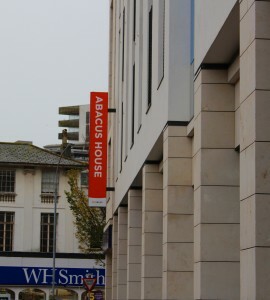 We are proud to announce that the Brighton Food Bank is now supported by Abacus House, a student housing complex based just off London Road. Based right in the heart of Brighton’s busy student scene, you’ll find Abacus House, a modern property offering a range of en suite bedrooms in shared flats of 3 to 5 bed apartments, and spacious studios that provide private living within a lively community. They can accommodate up to 351 students, and mainly serve students of Brighton and Sussex universities respectively. 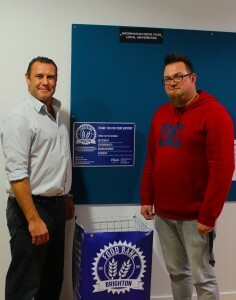 After meeting with Martin West, the residence manager of the complex, it became clear that they could support the Food Bank, by donating the students unwanted food at the end of the term. Our Food Bank drop bin is located in their common room, so that if they felt led, they could also support us throughout the year and not just at the end of terms. We look forward to partnering with this great organisation and the students, who will help feed our vulnerable clients in crisis. Thank you for your support. Barclays Bank in Henfield, is the latest business to be supporting our food bank, and over the Christmas period, have set up a donation point in their High Street store. If you work for an organisation that would benefit from a Brighton Food Bank bin, please email comms@bhcm.org.uk. 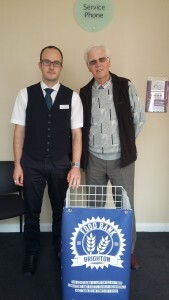 Photo: Barclays Store Manager James Halligan, (left) and David Sayers from Henfield Free Evangelical Church with the Brighton Food Bank bin.